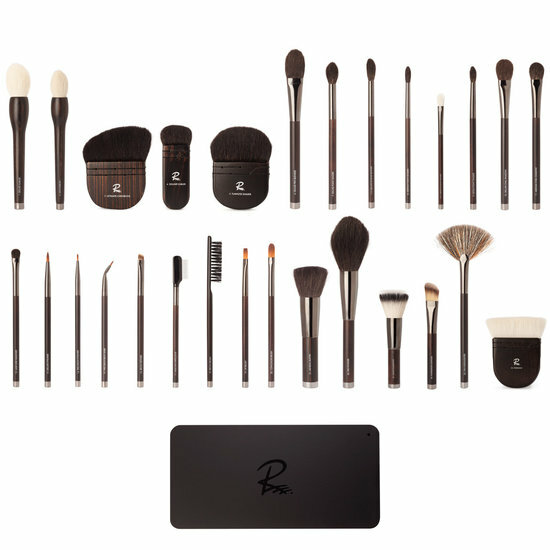 28 piece professional brush range personally designed by Rae Morris. The package came really fast and beautiful! It's not really strong magnet but still works really well. The texture and quality are awesome. I tried foundation and powder brush first then use deluxe kabuki to apply blush after open this box. Powder and kabuki brushes are soft and easy to apply on it! Totally satisfied! How amazing? well I've had 4 close friend comment on my facial appearance and they've asked if I've made a change in my makeup recently. This brush allows your makeup to look smooth and flawless on your face. Really, I did lots of research before purchasing this product, and by far this brush scored the highest. I know its expensive, but remember its an investment too. Super Happy, I can't stop sharing with others about how great this brush works. ! I recommend Rae Morris brush 27/ with Estee Lauder daily wear heavy. These are the two things I changed my makeup and brush. No regrets. Rae Morris is a genius! Her magnetic brush set is so cool. They look great on the plate and it's so easy to set them up so you can find the brushes you need. The magnet is in the brushes (not the plate) so you can also magnetize them to anything that is metal. The hair is super soft and really elegant, plus she has a lot of shapes that you don't find everywhere. They feel beautiful to hold and are well-balanced.